In one space, instructors from studios all over Columbus were leading 20 min “tastes” of their regular fitness routines. Various yoga & HIIT workouts were common, including an arm balance session with Studio 543. We got sweaty, saw lots of friends, met some new faces and of course, snapped a couple pictures. In the other space, various fit-minded brands were set up, offering samples of whatever it was they offer. Juices, clothing, massages, snacks, coffee… you name it and it was there! There were tons of local brands in attendance, but some of our personal favorites included Thank Yoga, Zest & Native juices, Orange Theory Fitness & Bend Active. On the way out, we chatted with the barista from The Roosevelt CoffeeHouse and learned a few tips about “acquiring a taste for drinking your coffee black.” The Taste of Fitness event was crazy amazing and we hope Rachel brings it back each year! Ohio State Four Miler / “Finish On The 50” takes place tomorrow morning! 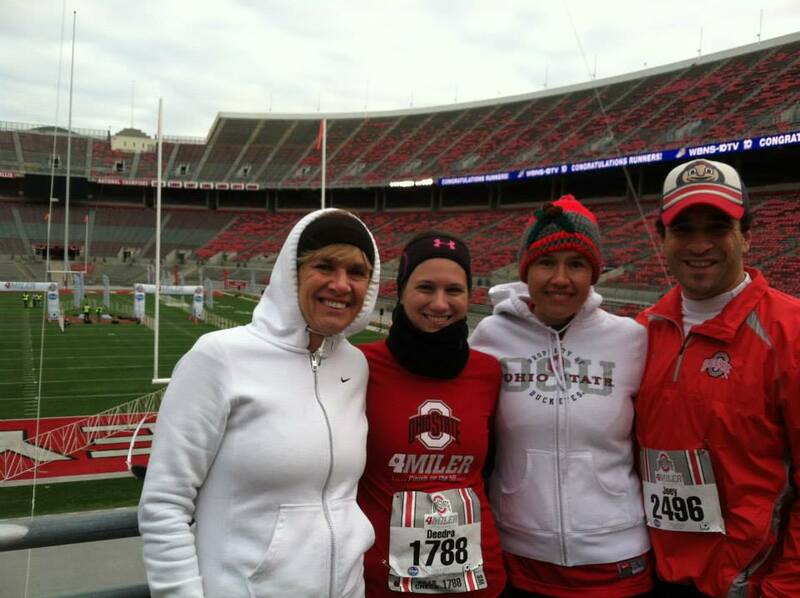 The 4th Annual Ohio State Four Miler takes place tomorrow, Sunday, Oct 23! 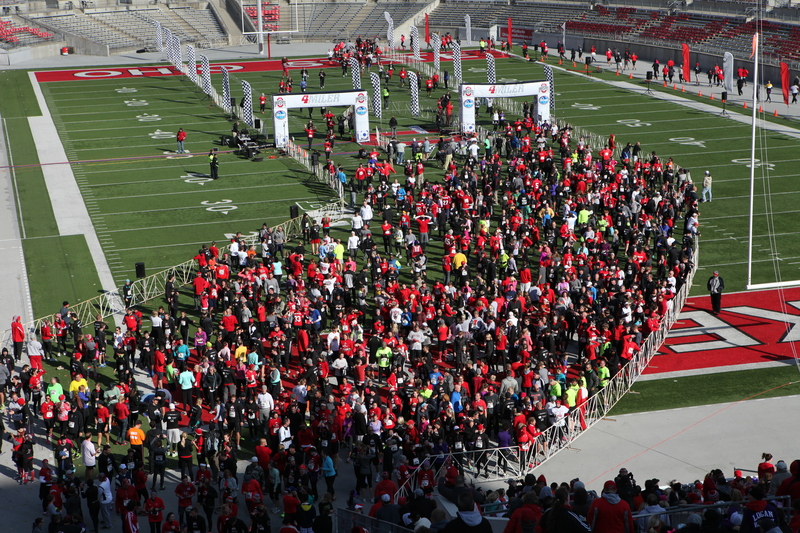 The event is a celebration of football and fitness that “finishes on the 50” of Ohio Stadium. This race sold out for the fourth straight year and is the largest 4-mile run / walk in the nation with 15,000 participants, up from its debut in 2013 of 10,000. The race takes place at 10 AM at Ohio Stadium. It begins in the parking lot on the Southwest Side of Ohio Stadium and finishes on the 50-yard line. The Start Stage will be located adjacent to Cannon Drive. The FREE Race Day Tailgate Party will also be held in the parking lot on the Southwest Side of Ohio Stadium from 9 AM to 1 PM. Special guests include Buckeye Greats such as Anthony Schlegel, Bobby Carpenter, Matt Finkes, JJ Sullinger, Ryan Miller, Lauren Shenk Miller, Terrence Dials, Jake Ballard, Scoonie Penn, Justin Zwick and Brutus Buckeye. Shelley Meyer will serve as the event’s Honorary Race Director. The Ohio State Four-Miler is a partnership between Ohio State Sports Marketing/IMG, the Buckeye Cruise for Cancer and M3S Sports. A portion of the proceeds benefits the Buckeye Cruise for Cancer and the Urban and Shelley Meyer Fund For Cancer Research. Good luck to all the runners, walkers & participants. 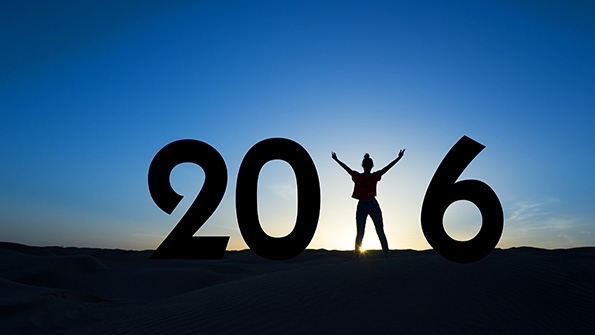 Send us your pictures, we’d love to feature them! As we gear up training for some of our fall races (Gildan Esprit de She 5k/10k is next week! ), we met up with Columbus Running Co‘s crew last Saturday AM. CRC offers free group runs at their various locations throughout Cbus and although we’ve joined in on CRC Dublin’s runs a few times, this was our first visit to the Short North location. Everyone was super friendly and the route was a breath of fresh air, a nice change from our usual out & back up Dublin Rd. We ventured out of the store, north on High St and jutted over to the Olentangy Trail, turning around at Lane Ave to make the loop back. We leave you with this quote (pictured above)… “There are no benches in running.” See you on the trails soon! We had a great time last Saturday morning at the Sweat Local Columbus 5K & fitness expo. Many of our local favorites were in attendance and there were plenty of opportunities to ‘get your sweat on!’ Thanks to Kelly and all those who helped put on this event. We hope to see all of you as we continue our Tour of Columbus! Recently a bunch of Living Fit gals, along with tons of other Cbus runners, participated in the FORE! Miler race. It was the second year for the event and we hope to run it every year. M3S always puts on awesome events and this one was no exception! It was a great run and a superb after party which included a live band, a drink ticket and of course, lots of photos (download yours for free HERE). Loved that my bib was 614, representing Cbus! Hope to see you all there each year! We’ve been following Living Fit runners, Peggy and Jen, on their journey to conquer the “Orange Effect” workouts at OrangeTheory Fitness. They both took on a six week challenge to push their bodies to the limits and each saw varying benefits. Jen noticed an improvement in her strength, stamina and overall athletic performance, while Peggy worked tirelessly to achieve a 10 pound weight loss! OK, so I’m hooked! I was excited and nervous when I started out on this OTF journey. Now I’m just plain excited! During the 6 week Weight Loss Challenge I’m happy to say that I lost 10 pounds. I didn’t win any cash or swag awards, but the changes in my body, stamina, and overall feeling of well being are reward enough. I even completed three of the 90 minute sessions. Yes, me – at 59! Who knew?! Jen (another Living Fit runner that took the OTF challenge) and I went to the beautiful gala at the end of the challenge held at Scioto Reserve Country Club. What an outstanding venue for the grand finale. It was fun to see everyone all dressed up – even hard to recognize some of the people without their workout garb and blood, sweat and tears! We enjoyed cheering for our home studios (Jen/Dublin, me/Hilliard). And we were very happy for all of those that did win the big cash awards and prizes. Congratulations to all!! Our Living Fit Columbus group runs are starting up again for the season and I’m so glad to know that I’m in such better shape to start out than I was last year. Did I mention I’m hooked? Well, I definitely am. I’ve signed up to continue these challenging, fat-burning workouts, even now that the challenge is over. Thank you OTF! I plan to keep pushing, keep burning and keep going ALL OUT for many more years to come. Here are Peggy’s before and after photos… 10 pounds lighter on the right! Peggy ‘after’ losing 10 pounds! With long work days last summer, I slipped back into some lazy habits of not working out regularly, and I had been lacking motivation. So, I was excited for this opportunity to participate in OTF’s 6 week Challenge. Orangetheory Fitness is broken into intervals of cardio and strength training using treadmills, rowing machines, weights, TRX suspension trainers and free weights. Each class includes up to 36 people. It is heart rate monitored training that is designed to target a specific heart rate that will stimulate metabolism and increase energy. The result they are looking for is known as the “orange effect” which allows you to burn calories for up to 36 hours after the workout. Hence the Orangetheory! Makes sense right?! According to their website: The physiological theory behind the Orangetheory workout is known as “Excess Post-Exercise Oxygen Consumption,” or EPOC. By providing you with a heart-rate monitor and POD, we can monitor your 5-zone interval training sessions that we call the Orange 60. During the 60-minute workout, you will perform multiple intervals designed to produce 12 to 20 minutes of training at 84% or higher of your maximum heart rate, which translates to Zones 4/5. This program design produces workout “afterburn” effect, which is an increased metabolic rate for 24 to 36 hours after the workout. When combining the amazing workout with EPOC, our clients burn an average of 500 to 1000 calories. At OTF, the workouts change every day, so there is always something new and you don’t know what to expect until the trainer tells you what to do. You can make it as easy or as hard as you want…but the point it to get in that “orange” zone. The trainers motivate you to get there; yet on an individual basis spanning all fitness levels. Not only have I found my motivation again, but my increase of muscle strength and cardiovascular fitness is truly incredible. For example, at the beginning of the challenge, I struggled to run a 60 second “all out” at 7.0 speed, and by the end of the challenge, I was running the same all out at 8.7. The great thing about Orangetheory Fitness is that your first class is FREE! They give you the opportunity to try it out and test the product before committing to a membership. Columbus currently has three studios, in Hilliard, Dublin and New Albany, with several more studios planned. Both ladies seemed to really enjoy OTF… enough that they are both regular members. 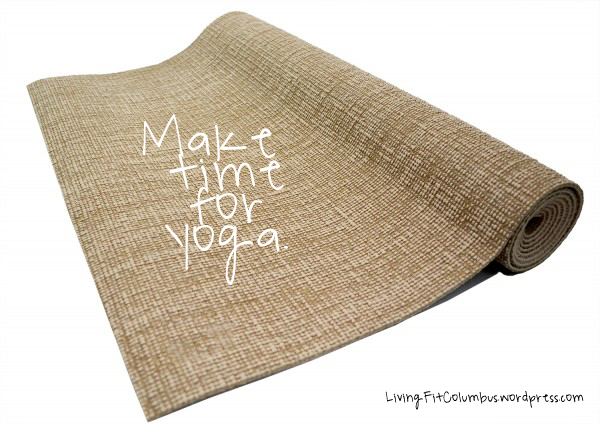 Contact your local OTF today, start burning and keep burning! two race entries to give away! The second annual FORE! Miler is right around the corner, happening right here in Dublin on Thursday, May 28th. Several of our runners participated in it last year and decided to make it one of our annual races… check out our post-race recap HERE. We’ve participated in several M3S races over the years, Cap City being another favorite. We’ve also previously interviewed race director David Babner, and discovered his love for the four mile distance he is known for. Participants that complete the following steps will be eligible for one free race entry. Deadline to enter is March 14th at midnight. Winners will be randomly selected and announced on March 15. Disclaimer: contest is only open to readers within the United States. Living Fit [Columbus] has not earned commission on this giveaway item.